On my walk through the neighborhood yesterday, I was still thinking about Florian Afflerbach, the German urban sketcher and architect who was killed in a motorcycle accident Thursday at the age of 35. Using the name Flaf on Flickr, he was well-known for his fabulous sketches of cars and motorcycles. Even though I never met him, I felt his enthusiasm for urban sketching and especially his passion for motor vehicles in every drawing he made. 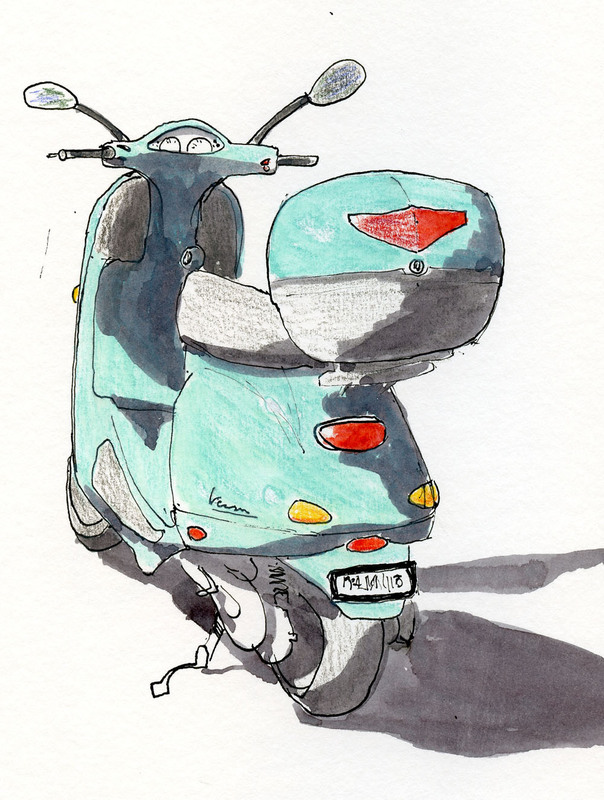 A few blocks from home, a pale blue Vespa was parked in a driveway. Thanking Flaf for inspiration, I sketched it in the summer-like sunshine. On a day like that, just breathing the floral-scented air makes me feel lucky to be alive. Thanks, Stephanie. Florian touched so many with his sketches.